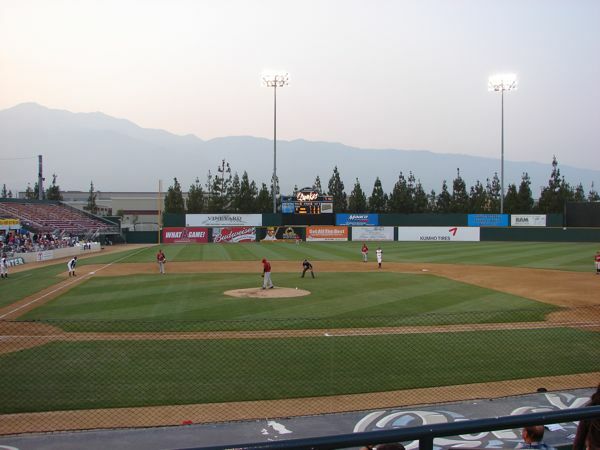 The R. C. Quakes, a Single A team, are affiliated with the Anaheim Angles. 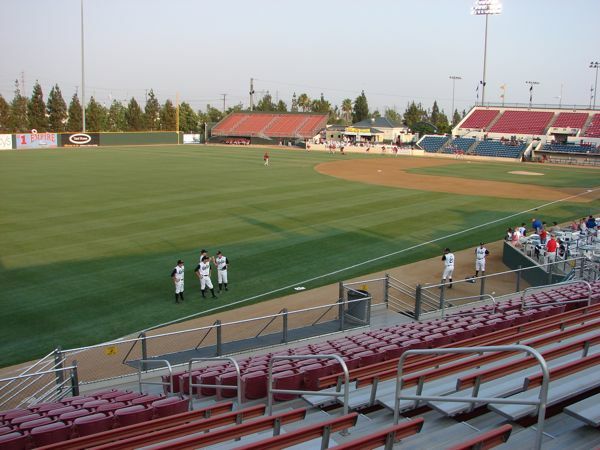 The 16 year-old stadium is called the Epicenter. 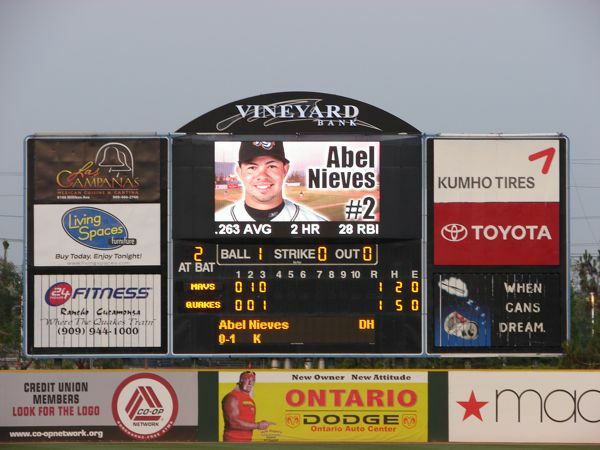 It's quite nice with two informative scoreboards. 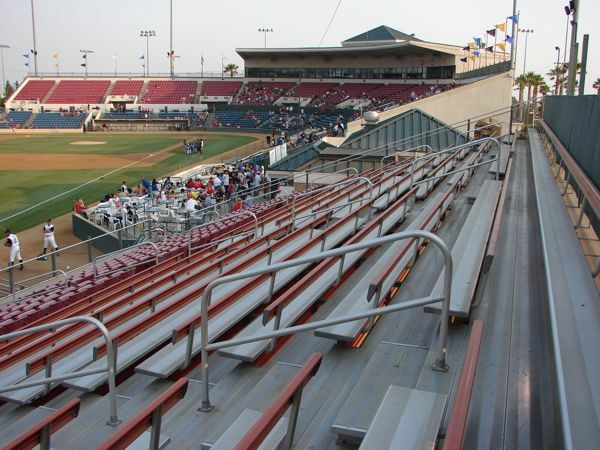 There are bleachers down both lines. The lines are RF-330', RC-375' CF-400', LC-375', and LF-330'. 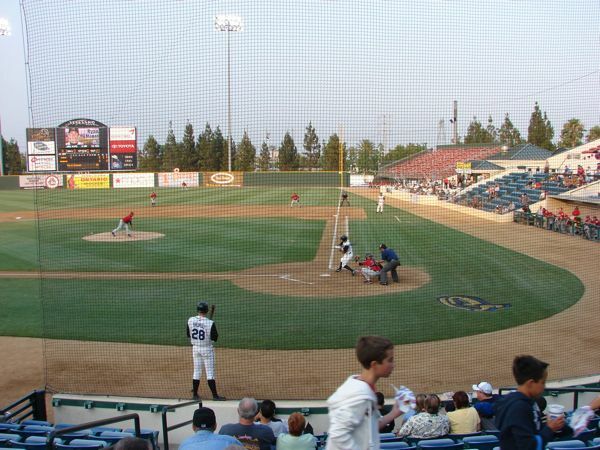 The Quakes were playing the Adelanto Mavericks. 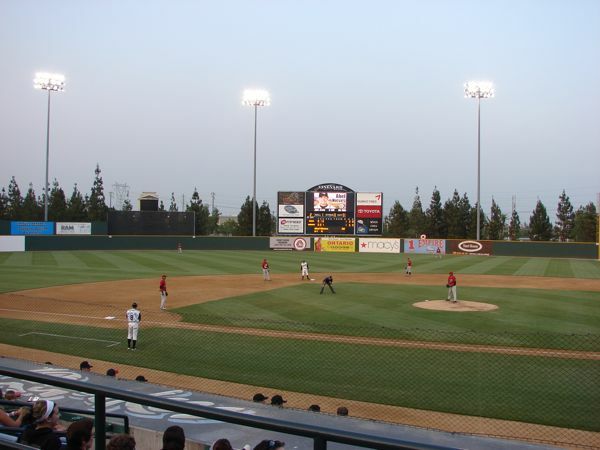 The Mavericks were ahead 3 runs at the start of the 8th inning and the Mavs new reliever put down the Quakes 1, 2, 3 in the bottom of the 8th. 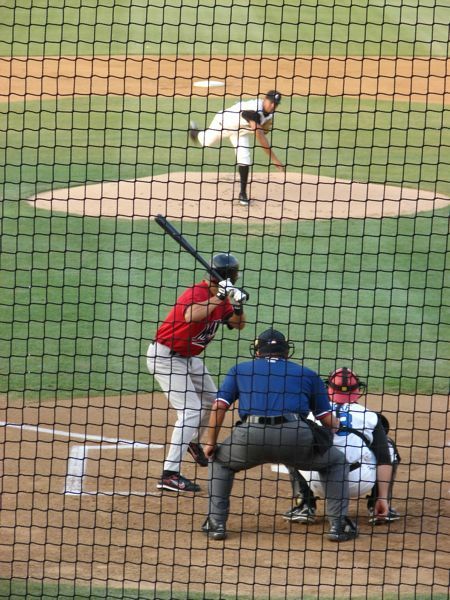 The new Mavs reliever before long gave up 3 runs and the game was tied 6-6 going into the 10th. 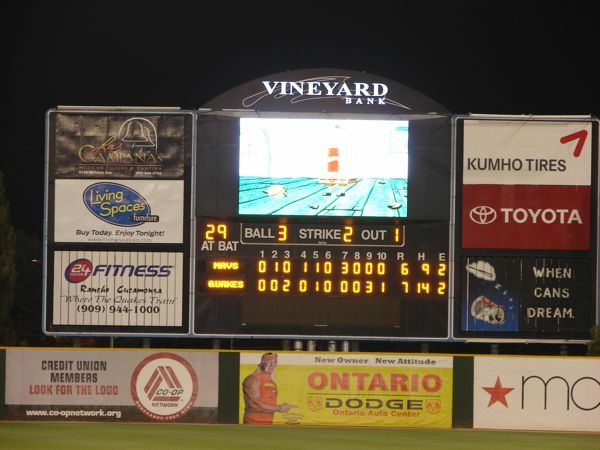 The Mavs had a runner on third with two out, but were unable to score. 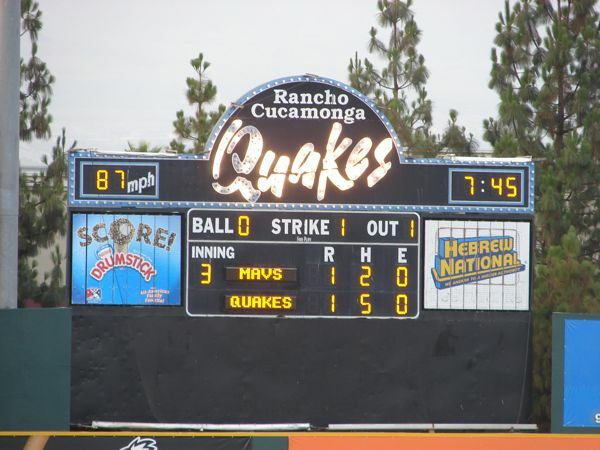 New Mavs pitcher in the bottom of the tenth with one out and a Quake player on third. 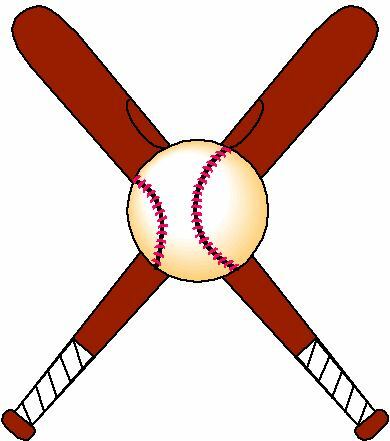 The coach made the decision to intentionally walk the next two batters to fill the bases. 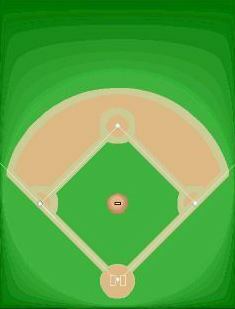 He then brought in the outfield and the infield hoping to get a double play. 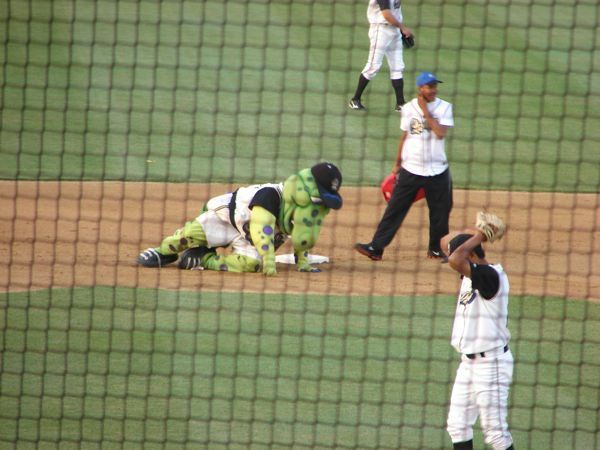 He was unsuccessful with the next Quake player hitting a short unplayable fly to the outfield which scored the winning run from third. 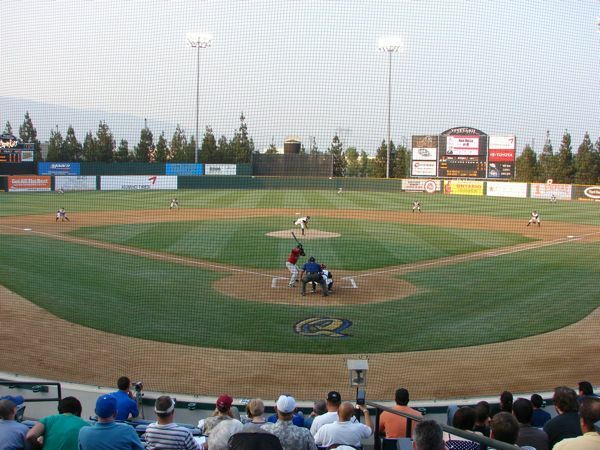 Quakes win 7-6. 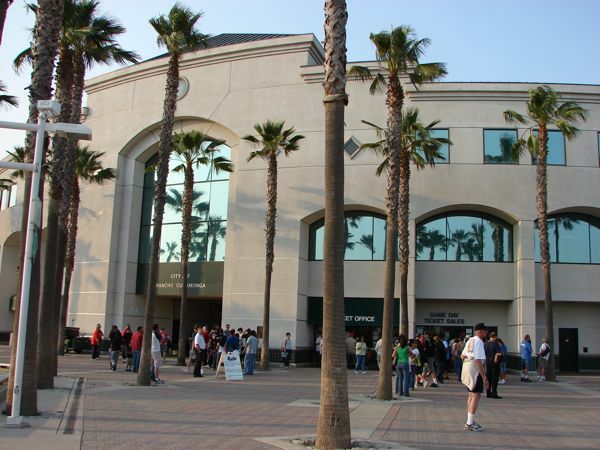 The box score was Mavericks R-6, H-7, E-2 and Quakes R-7, H- , E-2. Tonight was Thirsty Thursday with $1 12 oz beers and $1 12 oz soft drinks. 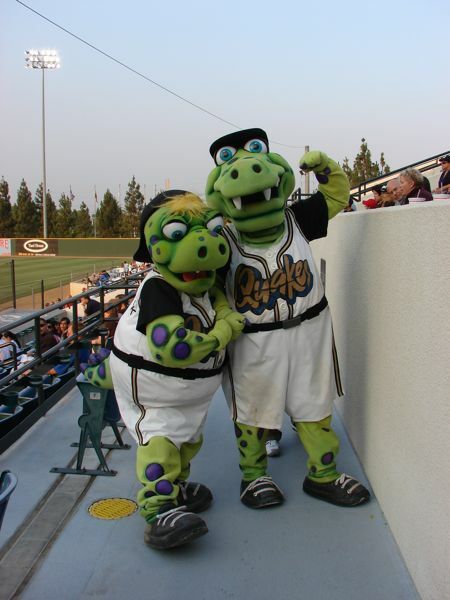 The mascots are Tremor the Rallysaurus with a shirt number of 4.8 and After Shock with a shirt number of 2.4. 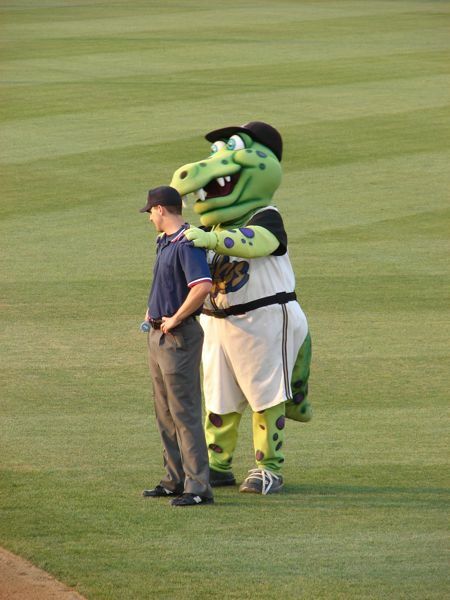 Tremor spent some time on a between inning break talking to the 1st base umpire and giving him a shoulder massage. 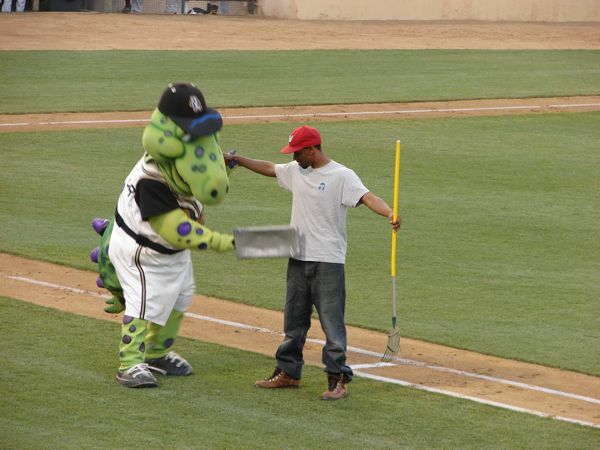 For the mascot race they had to fill him up with gas. Later he did a metal check of several of the staff. 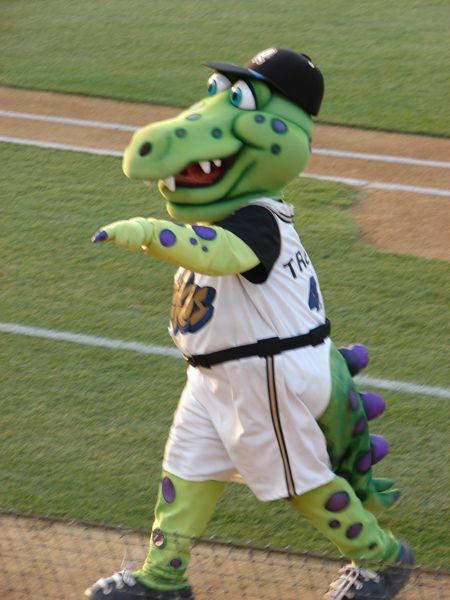 He got one to take off most of his clothes and when Tremor tried to pull down his pants he ran off the field. Jim would like to thank Kevin Shaw for a California League game used baseball. This was one missing from his collection. 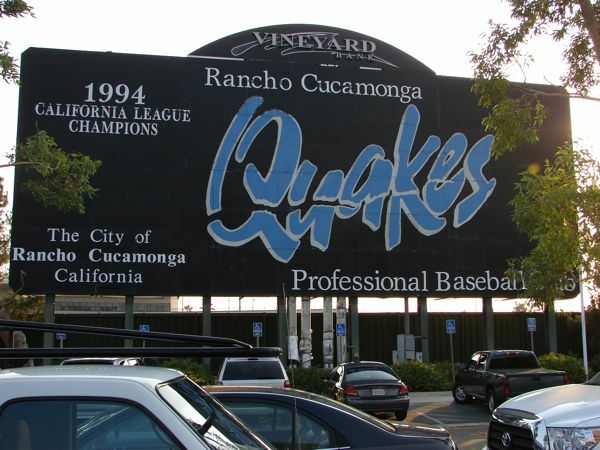 2001 new logo. 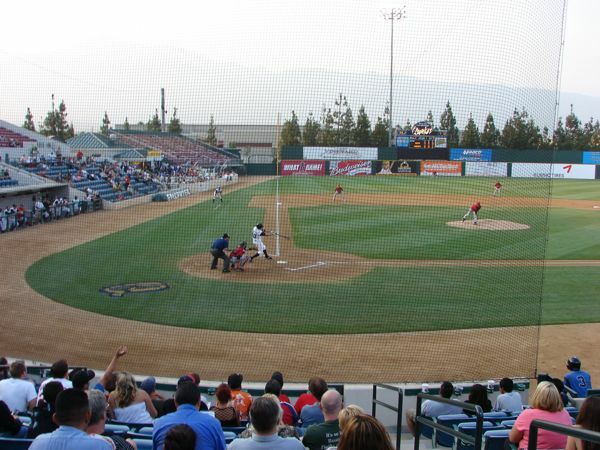 2007 affiliated with the Los Angeles Angels. 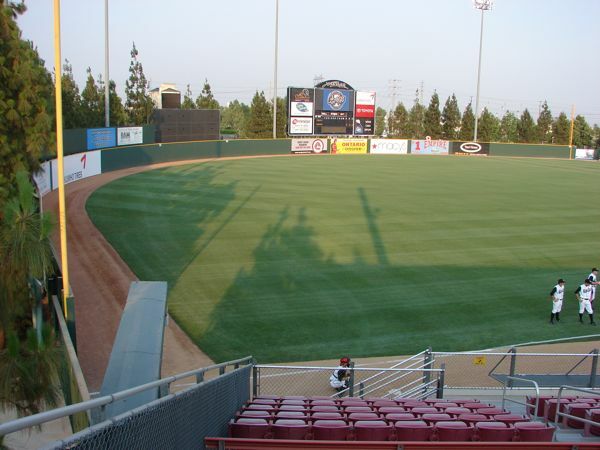 Name in 2014 is LoanMart Field and seats 6,615.